Here at Interloft Conversions we are the experts at transforming your unused loft space into a beautiful, fully functional living area which you and your family can thoroughly enjoy. Whether you require a nursery for a growing family, an office so you can work from home, or an extra living area in which you can relax, we create bespoke loft conversions tailored to your individual requirements and budgetary restrictions. With over 15 years of industry experience, there is little the experts at Interloft have not seen and overcome before, so you can guarantee that, however unique your specifications, we will have a fantastic, cost-effective loft conversion solution. Our loft conversion services include everything from design to installation to the final details to completion – and we’ll help you with legal requirements such as Building Regulations and planning permission, if required. Our services include complete loft conversions, part loft conversions and dormer loft conversions to suit all requirements. Please call 0800 999 4034 for more information or a no obligation quote. Our specialists are based in Tadcaster and cover the Yorkshire region. We project manage the entire attic conversion process, from the initial planning and design phase through to installation and completion, ensuring that the finished result looks beautiful and meets your every need. 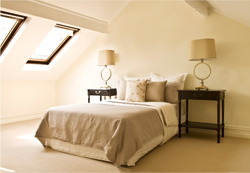 So why not give the professionals at Interloft a call today and see how a loft conversion could transform your home?